I just finished reading the recent BizEd article “Can B-Schools Rethink Research,” which poses questions I have been thinking about for several years: What does it mean to conduct responsible research in business? What is the role of impact factors and journal quality hierarchy? Is the time faculty spend conducting research time well spent? Of course, layered on top of each of these questions is academic freedom and its role concerning research. These questions are vexing, and the answers are not easily discernable. To set my impressions in context, I have been the dean at three different higher education institutions—two public universities with high research missions (one also had a robust doctoral program) and now at Santa Clara University, with a teaching/scholar model. In the dean’s role, I believe I have evaluated almost 100 faculty in all business disciplines for rank and tenure decisions. I have also chaired or been a member of dozens of continuous improvement review committees for AACSB. In all of these roles, the question about research—its impact and its quality—is always top of mind. Since the AACSB accreditation standards changed in 2013 to include impact as one of three areas a business school should focus on and report about, many schools and faculty have struggled to quantify research impact. A number of schools use faculty citation and similar impact factors to demonstrate that their faculty research had impact. Some have expanded the categories to include public policy changes, business adoption of models, and student outcome measures, to name a few; but most commonly, almost all schools, including my own, report faculty citation count to help gauge impact. While this measure helps convey the research value to other researchers in the discipline, it is clearly a closed-loop system. We are trained by people in our discipline, we attend meetings in our discipline, and our research is evaluated by individuals in our discipline. Articles are peer-reviewed by those in the discipline who have generally published in the journal and are edited by the same faculty. The journals are also largely discipline based, especially those considered top tier. Interdisciplinary work can be hard to publish, especially in top-tier business journals. In its simplest form, we only talk about our research with each other. We all know this can create many issues, not the least of which is bias. There is also significant evidence that business school research often does not impact the decisions made by business or the research of others in different business disciplines. Given these current constraints, are there other models we can look to in determining whether our research has impact? Unlike many disciplines in the sciences and engineering, where a third party provides some evidence of quality and impact through external funding mechanisms, business school research generally is not externally funded by either business or government agencies. Rather, the funding derives from internal business school or university resources. But as colleagues across the campus are well aware, external funding is not typically used as a measure of quality and impact. In addition, there is a continuing public dialogue about whether universities should be engaged in research at all and, if so, in what disciplines. Further, stakeholders increasingly want business schools to show that their research creates short-term economic impact for society. These were some of the issues that were surfacing when, in 2014, a small group of leading business scholars (eventually the core group grew to 24) engaged in a Responsible Research for Business and Management (RRBM) project. RRBM has now grown to more than 1,000 scholars, 85 co-signers, 900 endorsers, and 55 institutional affiliates. I was an early co-signer to the project in 2017, and I firmly believe in the vision and principles. The first sentence in the vision illustrates the aim of this dedicated network: “In 2030, business and management schools worldwide are widely admired for their contributions to societal well-being. Business and management scholarship has been central to solving society’s challenges, such as the achievement of the United Nation’s Sustainable Development Goals. Research is timely and cutting-edge, producing well-grounded knowledge on pressing problems.” RRBM’s seven guiding principles help define what responsible research looks like. Those principles include service to society, stakeholder involvement, impact on stakeholders, valuing both basic and applied contributions, valuing plurality, and multidisciplinary collaboration, and sound methodology. In reflecting on this bold vision, it is essential that we go beyond talking about it and begin to take specific actions to ensure we are engaging in and encouraging responsible research. Many of these actions will be disruptive, unpopular, and painful. AACSB’s Business Accreditation Task Force is looking at how current standards might need to be revised to help schools broaden methods and metrics for evaluating research and its impact. Some of the areas the task force should consider include the value given to journal rankings and citation counts. Also, how should a school’s mission be reflected in the impact metrics? For example, should a doctorate-granting school use the same metrics as a school with a teaching/scholar model? These are not new issues for AACSB. In fact, in 2008 a task force for research impact produced a white paper. 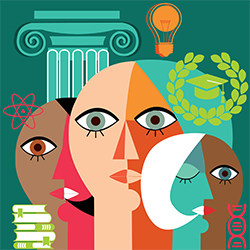 For schools, there are questions around how research impact should be viewed in light of traditional and historic evaluations for faculty rank and tenure. The role of external peer reviewers also needs to be examined. In my experience, reviewers rely almost exclusively on journal impact factors, top-tier journal lists, and citations. Further, there are significant questions concerning research relevance, given the length of time it takes to publish in top-tier journals. Most, if not all, of the top-ranked academic business journals take years to publish a particular piece. As a comparison, it usually only takes just four to six weeks to get a decision on whether a paper is accepted in Science and Nature, two of the most prestigious journals in their field. In today’s current business environment, it is hard to imagine that research is relevant four to five years after it was conducted. RRBM has several possible action steps ahead, including developing new visions and strategies for faculty to focus on impact, redesigning promotion and tenure criteria, and expanding metrics for measurement. There is no single step that will change the entire culture, but it is important that we begin taking direct actions to address this pressing issue. I fear that if we fail, we risk having external controls imposed on us, including an unwillingness to continue to fund faculty research time with institutional resources. I welcome your insights. Caryn Beck-Dudley is Dean of the Leavey School of Business at Santa Clara University in California and Chair of the 2018–19 AACSB Board of Directors. Follow her on Twitter @BeckDudley.